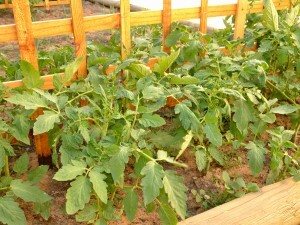 My tomato plants are looking fantastic! I took the last photograph a week ago and look how they have grown. I can’t wait for them to mature. I bought a few Italian tomatoes from the grocer today, but they are not as tasty as the ones you pick from your own garden. I water them almost every day and I use the Worm Tea from my worm farm as a pest repellant and it is also great for improving growth! How organic is that!!?! Sure thing! That will be the next post I will put up. It is so easy to maintain and started producing in weeks. It is the Worm Tea that is liquid gold for your plants – I believe. Will get cracking on it!! Any organic gardener must have this! I want to see your worm farm … when you going to put pics up?? And I want to hear how it works! Have been thinking about getting one. But my soil is saturated with earthworms so don’t know if I need it?